Regarding water vapor or, equivalently, relative humidity feedback, we can think of theory/modeling as providing a “prior” which is then modified by observations (trends, interannual variability, Pinatubo response). My personal “prior” is that relative humidity feedback is weak. or, conversely, that the strength of water vapor feedback in our global models is about right. In justifying this prior, I like to start with the rather trivial argument, already mentioned in the last post, that the amount of water vapor in the atmosphere cannot possibly stay unchanged as the climate cools since many regions will become supersaturated, including the upper tropical troposphere where most of the water vapor feedback is generated.. So to expect specific humidity to remain unchanged as the climate warms requires the present climate to be close to a distinguished point as a function of temperature – the point at which water vapor stops increasing as temperatures increase. Its not impossible that we do reside at such a point, but you’re going to have work pretty hard to convince me of that — it doesn’t strike me as a plausible starting point. Of course, there is also the community’s collective experience with global atmospheric models over the past several decades. Less familiarly, there is experience more recently with the kind of “cloud-resolving” models (CRMs) discussed in Posts #19-20. I am going to focus on the latter here. This will have the advantage of introducing what I consider to be the physical mechanism that could most plausibly alter the strength of water vapor feedback. In global climate models in use for climate studies, which typically have horizontal resolutions of 50-200 kms, most of the turbulent motions transporting heat, momentum and water vertically in the tropics are not resolved by the grid and must be provided by a sub-grid closure scheme. Our ability to develop convincing closures for moist convective turbulence remains limited. In contrast, in CRMs the horizontal grid size might be 1-3 kms, which begins to resolve the most energetic motions responsible for vertical mixing in the tropics, the convective plumes that reach from the surface to the upper troposphere. There is still sensitivity to the treatment of subgrid motions at even smaller spatial scales, but there is little doubt that the explicitly resolved deep convective plumes provide more realistic simulations of tropical mixing than our attempts at subgrid closure in global models. The first thing to notice is that the changes in the relative humidity profile in these models as the climate warms are small. (Some aspects of these small changes, especially the upward displacement of the relative humidity profile in the upper troposphere, are robust features across simulations of this type.) The point of comparison is the reduction in relative humidity needed to maintain constant specific humidity, which would be about 6%/degree C warming near the surface to 12%/C or so in the upper troposphere. The temperature changes in these simulations are close to moist adiabatic, as shown in Post #20 for the Romps simulation. So the relative humidity feedback in these models is very weak, just as in global models. There are a lot of these cloud resolving models in the literature, in domains with different sizes and shapes, some in the “pure” radiative-convective configuration I am focusing on here, others with some specified large-scale flows superposed — they all look similar in this regard. Something else you have probably noticed is that the relative humidities in these two models are quite different (the model on the left is drier throughout most of the troposphere). While I am only showing two models, this large spread is also representative of models of this type. The following picture is the one that I think of when looking at results such as these. Air is carried up to the upper troposphere in deep convective plumes that extend to various heights – when the air emerges from these plumes it descends very slowly. This skewness of vertical motion, rapid ascent and slow descent, is consistent with the small areas covered by the convective plumes, and is a distinctive feature of the tropical atmosphere, as understood by Riehl and Malkus in the late 1950’s . We can think of the air as saturated when it emerges from the convective plumes, and as it descends it warms and its relative humidity quickly starts dropping. If it makes it into the lower troposphere without incident its relative humidity would be a few percent or lower! But this decent might take 2 or 3 weeks, so descending parcels will typically mix with air that has recently been moistened by water detrained from convection at these lower levels. Near the surface the air is moistened by mixing with the water that is constantly evaporating from the oceans (these models typically assume a saturated surface), so we end up with a minimum of relative humidity in the interior of the troposphere. But the strength of this minimum depends on how far typical parcels descend before being moistened, and this depends on how the convection is organized. Picture someone in the tropics with a big garden hose pointing upward, trying to moisten the air before it descends too far and its relative humidity drops to near zero. Standing in one place would be very ineffective –assuming that there is relatively little horizontal mixing going on — the hose would always be moistening the same small fraction of parcels, wasting water by moistening parcels that are already moist, and allowing the troposphere as a whole to dry. Moving the hose around or using many small hoses simultaneously so to moisten more air parcels, while using the same amount of water, would be much more effective. Post #19 shows an example of how the organization of convection can change drastically in a CRM as a function of a model parameter. 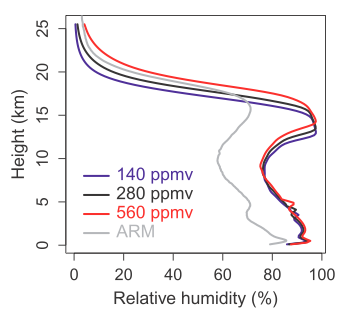 The mid-tropospheric minimum in time-averaged relative humidity in the aggregated state is 15% in the model described there, as constrasted with about 60% in the more disaggregated state! CRMs differ in their mean relative humidity profiles because they organize convection differently, due to model differences of various kinds, including domain size and shape, resolution, cloud-radiation interactions, surface flux formulations, etc — these dependencies are not well understood. Relative humidity changes are small when these models are warmed because this organization does not change significantly in response to the warming. Despite these possibilities, integrations with CRMs to date, such as those shown at the top, have helped solidify my theoretically-based prior, which I think of as the most conservative possible: nothing much changes, including the convective organization. I’ll cover the way in which observations reinforce or modify this prior eventually. 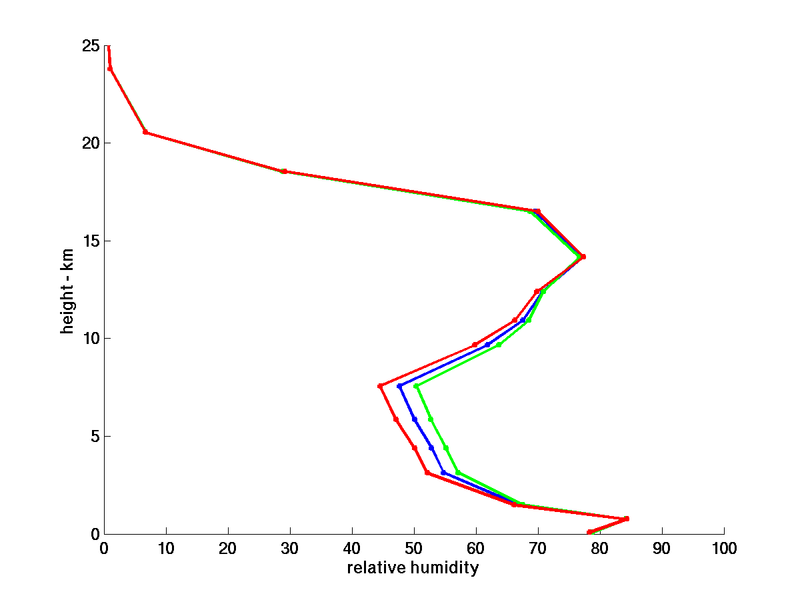 I thought I would add a plot of the time mean relative humidity simulated by the 50km global atmospheric model that I have been using for illustrative purposes in a lot of these posts — at the same geographical location (Nauru Island) for which the observed profile was included in the plot on the top-right. The red line, the driest profile shown, is the closest grid point to Nauru. I then plotted several other points moving westward a total of about 10 degrees longitude. There is an east-west gradient in humidity, with humidity increasing westward — the model’s isolines of midtropospheric humidity are displaced about 10 degrees to the west compared to observations along the equator in the western Pacific. The mid-tropospheric minimum also appears to be reached somewhat lower in the atmosphere than observed. (This is, once again, a free-running model except for the prescribed sea surface temperatures). These GCMs and cloud-resolving models are complementary tools — we can even try to combine them in “super-parametrized” models, such as Khairoutdinov et al 2007. A couple of qualitative comments about the difference between the model runs and the observation in the figure on the right would help me understand why you’ve chosen that observation to spotlight. 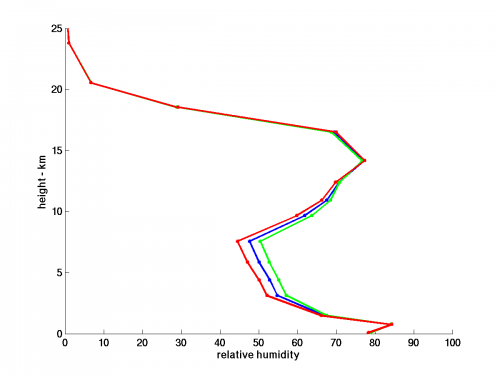 I didn’t choose the observed profile — it happened to be included in the plot of model-generated relative humidity that I picked and seemed useful as a point of contact with observations. One of the two models shown is drier than this observed profile and the other is moister. The observed profile is in the W. Pacific, in a region of mean rising motion — one shoudn’t assume that a radiative-convective model, in which there is no mean vertical motion, should fit this closely. Global models have substantially smaller spread in their relative humidiities than RCM simulations of radiative-convective equilibrium, by the way. “RCM simulations” vs global models – do you mean “CRM simulations”? (Hopefully all the models are RCMs if that means radiative convective models). The profiles are spatially averaged – so one could plot “error bars” left and right of the profiles, representing areas of maximum upward and downward convection I assume. Maybe these would bound the observed profile (in some cases)? Is there a handy reference document for showing different profiles as a function of latitude and CO2 concentration, among other variables? Or even better an online tool that will generate them? Something like MODTRAN? Thanks, I’ve changed all of the “RCM”s to “CRM”s — I probably should avoid acronyms completely. The profiles are averaged over time as well as space. Actively convecting grid points in these models will be effectively saturated. 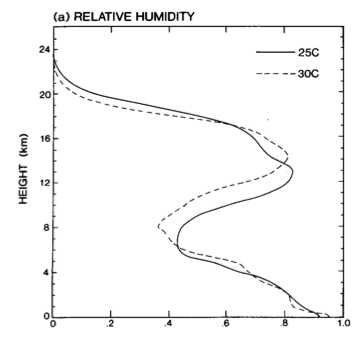 There is a lot of literature discussing the distribution of vertical motion and humidity in these kinds of models. Thanks, I will look for answers to my question in AR4 and see if that helps me clarify what I am looking for and may ask again afterwards. This is a key question for the tropics, but not one that I can provide a short answer to. There can be some downwelling in the immediate vicinity of the upwelling cores, driven by the cooling generated by evaporation of condensate, but when trying to understand the large-scale structure of the tropics it is best to consider this as part of the convective core complex itself. In thinking about the tropics it is easier to start by thinking about the non-rotating radiative-convective equilibrium described in the post. The picture we have there is that the downwelling is distributed more or less uniformly over the domain, irrespective of how the convection is organized — the large-scale horizontal motions organize themselves to be consistent with the organization of the upwelling convective cores, whatever that might be, and this uniform subsidence. It is the subsidence that drives the horizontal flow, rather than vice-versa, and the subsidence itself is determined by the need for the adiabatic warming that occurs during subsidence to balance the radiative cooling. In a rotating atmosphere things can be a little different, but the rotation is weak in the tropics (the horizontal component of the Coriolis force is weak) so this non-rotating picture is still a good starting point. Thanks for this very enlightening post! You refers to “organization of convection” as the reason why models differ so much on the mean state of RH profiles. From an observational point of view, may I interpret this “organization of convection” as PDF of the altitude of detrainment level of tropical convections? If such PDF could be estimated from observations, to what extent you think it can help constrain or improve modeled organization of convection, in GCM or in CRM? Thanks. The PDF of detrainment altitudes is an interesting quantity but it is not quite what I mean by “organization”. If all the convection is confined to the same small region, with uninterrupted subsidence outside this region, the mean humidity will be very low irrespective of the pdf of the altitudes of detrainment from convective cores in the small active region. The bottom line is the pdf of the distances over which air subsides before being moistened by convection.